Umbrella stands are a useful addition to your hall, especially during the winter weather or when April showers are upon us. We have a good collection available at Contemporary Heaven, from several manufacturers including Umbra Umbrella Stands, Balvi Umbrella stands, and a slick Stainless Steel one from ultra-modern minimalist designers Blomus. 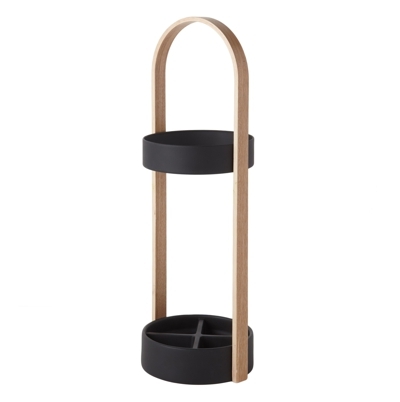 This modern style elegant umbrella stand made by Canadian designer and manufacturer Umbra, is crafted from light wood and black resin. Minimalist yet practical, this modern stand has a dished resin base that collects the excess water, but doesn’t rust. Plus, the elegant design takes up little space and hold 4 umbrellas easily! If you have a modern house, office, or apartment and want something stylish and unique, this is it. Finished in quality brushed stainless the Symbolo boasts a removable tray for collecting the drips from your used umbrellas. Sleek and stylish as you’d expect from Blomus, this piece looks way more than the price tag suggests. This black metal umbrella stand has been cleverly designed out of silhouettes of people. When you look closely you’ll see they’re all holding umbrellas, making a tubular type stand in which you can place yours. Large enough to hold several umbrellas, and with a very low price, this piece is practical and quirky. This funky little piece only holds one umbrella but it’s a lot of fun too! Designed to look like a splash of paint, it comes in a bright orangey red colour and makes your umbrella look like it’s dripping paint onto the floor around it. We have lots of other umbrella stands to choose from, plus hat and coat stands with built in umbrella stands, and a whole host of other funky and contemporary products for your home and office. You can always buy from us with confidence using our online secure system, and we always aim to have the best prices anywhere. Let us know if you see the same thing cheaper elsewhere, we’ll match it for you.